Antoinette Brown Blackwell was the first woman to be ordained as a mainstream protestant minister in the United States and distinguished herself from her contemporaries with her use of religious faith in her efforts to expand women’s rights. Antoinette attended Oberlin College, known for its evangelical theology and its commitment to the equal education of women and African Americans. There she met and made friends with Lucy Stone, who shared Antoinette’s interest in woman’s rights and the abolition of slavery. This friendship lasted throughout her life and indeed Lucy and Antoinette were to become sisters in law when Antoinette married Samuel Blackwell, the brother of Lucy Stone’s husband, Henry. Antoinette received her literary degree, which at that time was the only available course for women students, but then pressed the college for admission to the theological course. The college eventually agreed but while Antoinette was allowed to study the course she would not receive a formal degree in theology. The degree was eventually awarded to her twenty eight years later! Being unable, therefore, to obtain a permit to preach, she focussed on delivering lectures as an advocate of women’s suffrage, the abolition of slavery, and temperance. She was involved with many organizations on behalf of women’s rights and helped found the American Woman Suffrage Association. 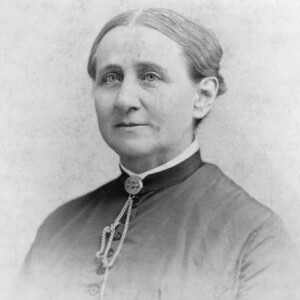 She was finally ordained as minister in 1853, becoming the first woman to be ordained in a regular Protestant denomination in the United States. She continued her reform activities and, most notably, was at the centre of a controversy at the 1853 World’s Temperance Convention where delegates reacted angrily to her attempts to address them and refused to allow her to take the platform and to speak. Her ministry lasted only about a year, when theological differences with her congregation prompted her resignation. Following her separation from the ministry, she focused issues of women’s rights and women’s suffrage. Antoinette, unlike many of her peers, saw that there was a distinction between these two issues and cared just as much about improving women’s status in society as she did for the cause of women’s suffrage. She believed that suffrage would have limited impact unless it was coupled with opportunities for women to make a difference to society by holding positions of leadership. She argued that the right of women to education and employment outside the home was an equally important goal and emphasized that it was not sufficient to allow women to enter the world of work, but that men needed to become equal partners in the home. She founded the Association for the Advancement of Women in an attempt to address women’s issues that similar organizations ignored. She further split with women’s rights campaigners on the issue of liberalization of divorce laws as she held a traditional view that marriage was a lifelong commitment. She was keen to put her beliefs on a scientific footing and wrote The Sexes throughout Nature which was described at the time as “a feminist critique of the evolutionary theories of Darwin and Spencer. In this book she argued that nature demonstrated and confirmed the equality of sexes throughout the species. She also worked in the slums and prisons of New York and raised money for those that lived there. In addition to her scientific and reformist publications, she also wrote a novel and a collection of poetry. The mother of seven children, five of which survived childhood, she remained active in the women’s movement well into the twentieth century and continued to preach, delivering her last sermon at the age of ninety. Aged 95, she was the only one of the early suffragists who survived to see the passage of the Nineteenth Amendment to the Constitution, which gave women the right to vote. She died aged 96.